Dorie Greenspan has been one of my baking idols for years now. I used to read Baking with Dorie religiously, and still check out her latest recipes appearing on the web. Her cookbooks have been on my wish lists for years now too. She is without a doubt one of the majors in the baking world. You can imagine the squeals I had when I heard she was going to finally be selling her cookies! It took three days and two tries to get to her though. Day One lunch was taken by Daniel Boulud. Day Two was sold out for the most part. Day Three I used the snowstorm to my advantage. 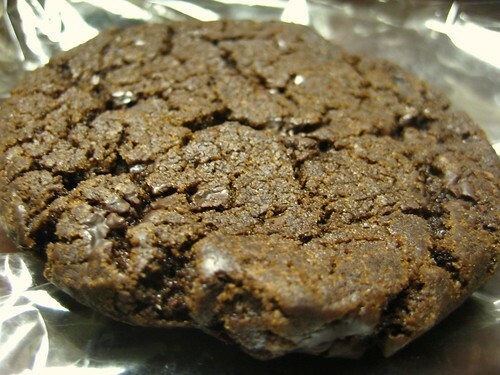 "Brownie, four cookies procured, $10, will meet up after work to eat! Excited!" 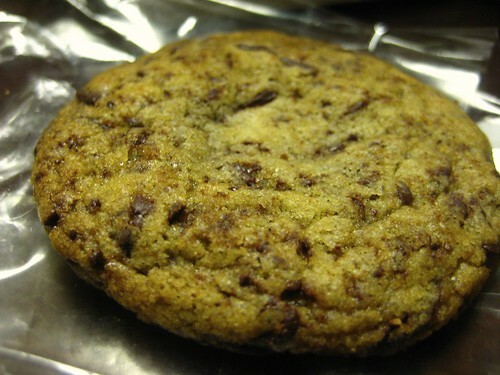 First on the list was the Chocolate Chunker (a non-Brownie cookie). Three different chocolates, salted cashews, and dried cherries were exactly what Ginger and I needed for an afternoon pick-me-up. The slightly crunchy outer layer reveal a fudgey interior, packed with nutty goodness while the cherries give you a good ratio of super-sweet spots. 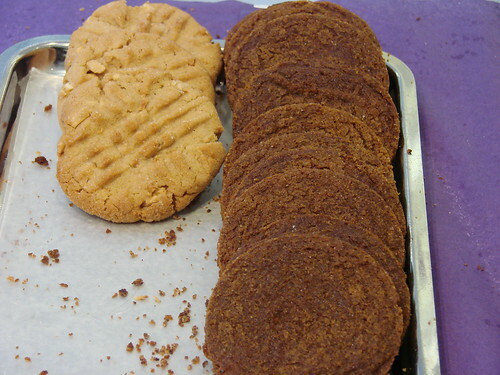 Of all that I had, and I didn't have all her cookies, this was my favorite (followed by the Molasses Spice). But at $3.50 a cookie, I can't see myself buying this very often. Third favorite was the World Peace cookies, two types of chocolate and fleur de sel. 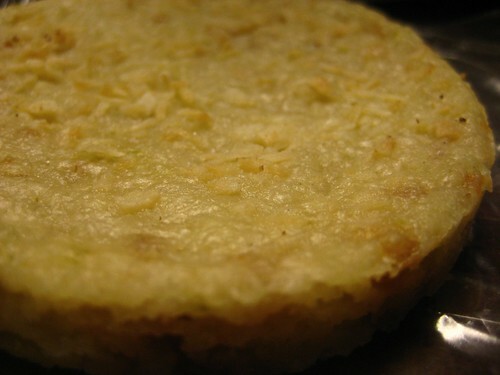 I liked the crackle, crunchy outer layer, with chewy interior. 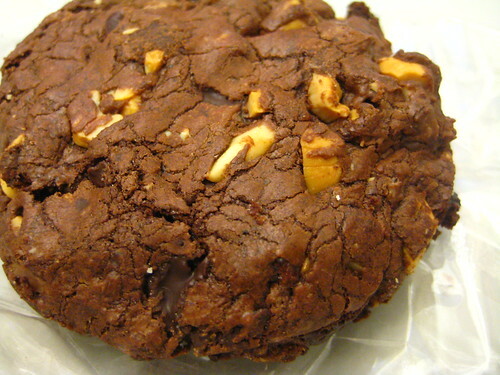 This seemed closer to a chewy brownie, a very decadent chocolate cookie. $2.75 makes this a very special treat indeed. Coming in the four spot was the Coconut-Lime, a different combination than one usually sees. More tangy citrus than coconut, it was still enjoyable and refreshing. This would be fun to use as a cookie sandwich with key lime pie ice cream. At the bottom of my list was her interpretation of my favorite cookie, the Chocolate Chip. On the chewy-crunchy spectrum, this falls squarely in the chewy through-and-through range. The chocolate was good, but I prefer my chocolate chip cookies to have a more prevalent vanilla, butter, and brown sugar flavor. When she does move into her permanent spot, I may want to try this one again, but I may just put that money towards a Chocolate Chunker. 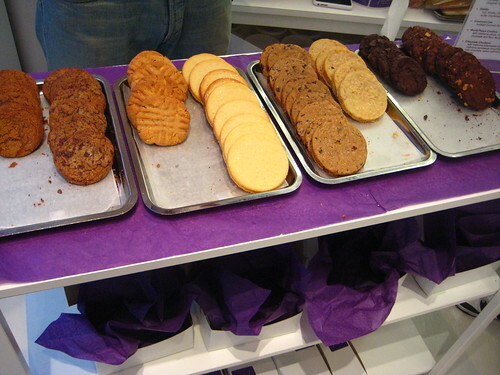 Dorie Greenspan's Cookie Bar will be a Mizu Salon through this Saturday, the 13th. They open at 11am and go until sold out. Be sure to check their Twitter. Mizu Salon is at 505 Park Avenue between 59th and 60th Street, look for the pink ribbon umbrella trees that belong to the florist next door. Idealic? Do you mean idyllic? Oh, you made it there. Brilliant!